RecurDyn has an interface specially designed for co-simulation of dynamics of rigid bodies and fluids. RecurDyn is the world’s first commercial Multi-Body Dynamics software to offer such an interface. This interface allows you to simulate complicated fluid-solid interactions that were very difficult to simulate in the past. You can now simulate the coupled interaction between the two easily, so that the solid bodies and the fluids affect each others’ behaviors. In addition, Particleworks supports multi-GPU computing. Thus, it is capable of simulating from hundreds of thousands to millions of fluid particles, allowing it to simulate very large-scale models. As a result, when Particleworks is coupled with a solid-body dynamics simulation software package, it becomes suitable for co-simulation of fluid-solid dynamics. And thus, through co-simulation with RecurDyn, you can further broaden the application scopes of both software packages. RecurDyn’s unique ParticleWorks interface allows you to easily perform co-simulation of solid and fluid dynamics. Through co simulation with RecurDyn, ParticleWorks allows you to capture the effect of fluids interacting with mechanical systems. Particleworks allows you to directly import 3D data from CAD software for defining the volume boundaries. Various boundary conditions and material properties can be applied to imported data. You can view or output the simulation results in various formats. Import 3D data from CAD software (STL format). Generate fluid particle sources and sinks (through circular, rectangular, or arbitrary shapes). Output coordinates, velocity, pressure, shear rate, torque, etc. in various formats. View or output the simulation results as image (JPEG / PNG), video (MPEG / AVI) or STL files. The solver also allows you to calculate shear rate and torque, etc. from velocity, pressure, and temperature of fluid. 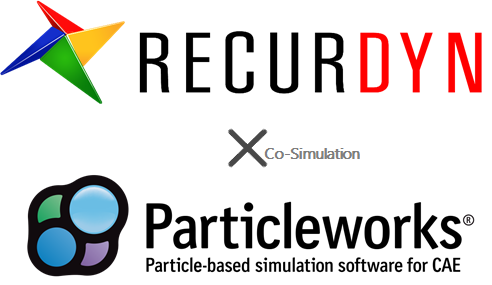 Particleworks supports running its solver on a multi-GPU system. 2D fluid simulations are also available.